Gerlos may be little-known on the English-speaking ski market but the scope of skiing available here and the recent infrastructure development of the ski areas means that it can certainly hold its own against some better-known rivals. The lift link with Zell am Ziller via the Wilder Krimml was a bitterly-controversial one at the time but for skiers the connection has opened up easier access and expanded the reach of the area. 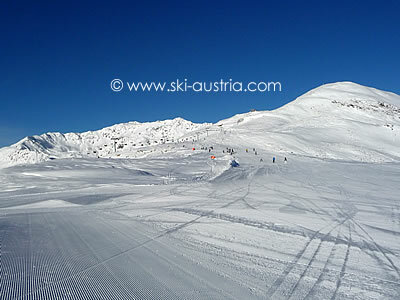 It is one of the few Austrian ski areas where to ski from one side to another will now take most of a day. The Gerlos ski area can be divided up into three different sectors: the area above Gerlos; the area above Königsleiten; and the Hochkrimml-Gerlosplatte lifts opposite Königsleiten. 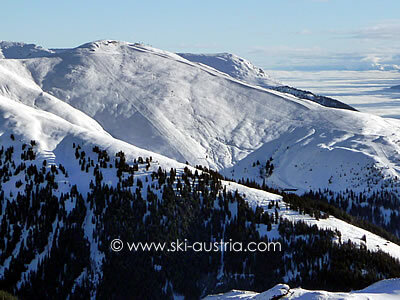 And, of course, a fourth area referred to above is the Zell am Ziller ski area which connects into the mountains above Gerlos, but which is covered in the Zell am Ziller Skiing page. The Gerlos ski area is perhaps the least interesting of the three. The Isskogelbahn gondola on the edge of Gerlos provides access into the main area of motorway pistes ideal for low intermediate and beginner skiers. The slopes and lifts here can get quite crowded in high season - especially the Ebenfeld X-Press chairlift which is a vital part of the route back to the Zell am Ziller area for those who have travelled over earlier in the day. The route back down under the gondola is an option for a good long ski and there are alternative red routes either leading into the centre of Gerlos or to the Isskogelbahn base station. In the direction of the Zell am Ziller the Stoamandl chair and the long Krimml X-Press chair provide scenic and undemanding wide path-like trails through the valleys. 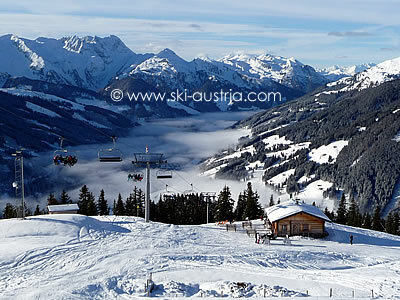 More information about the skiing is available on the Zell am Ziller Skiing page. With all these intermediate goodies around, it comes as some surprise to be hit with the long black run down which is the only ski trail to the connection with Königsleiten. A short two-seater chairlift from the bottom of the Krummbach X-Press chair links to the Fussalm X-Press chairlift with its long red run and, following that ride to the new Falschbach gondola, which rises above a two steep black runs and an expanse of off-piste skiing in between. It also provides the link into the main Königsleiten area. Some more interesting long reds and good snow can be found at the end of the Königsleiten 2000 and Mitterleger chairs, while the run down under the Dorfbahn gondola will bring skiers into the centre of Königsleiten. Alternatively, taking the route on either side of the Larmach chair from the top of the Falschbach gondola (or the other lifts mentioned above) will lead into the long intermediate run down to the Gerlos Pass road. There is also a lovely view of the Durlassboden reservoir and the mountains behind on the way down. 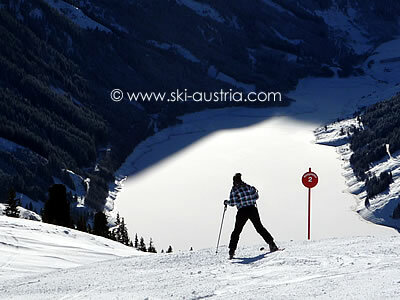 A quick ski over the road bridge brings you to the bottom of the Hochkrimml-Gerlosplatte area. 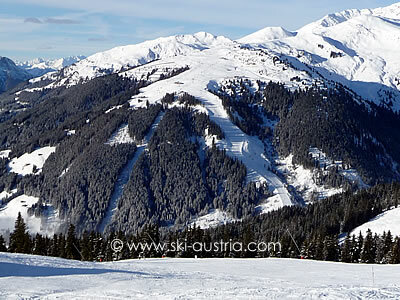 This third ski area is an intermediates paradise with chairlifts and draglifts radiating out below the Plattenkogel peak. The main Plattenkogel X-Press chairs above the hamlet of Silberleiten link into the Duxeralm area and the Speedy chair above the Filzstein car park. As with many larger ski areas connecting different resorts together, skiers who have journeyed a long way from their starting point should be aware of the time and leave early enough to avoid long queues at bottlenecks where a single lift is the only way into a particular area, especially those who are heading to or from Zell am Ziller. The live webcam stream below is taken from the top of the Isskogelbahn. Other webcams in the Zillertal Arena area are available by clicking on the middle button above the webcam stream.